Survey Site Proof of Payment! Yay! 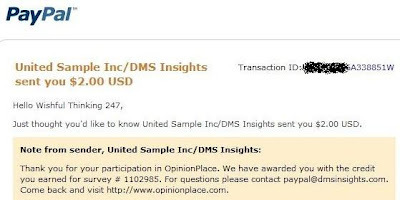 A few days ago I took a short survey (5-10 min) from OpinionPlace, and I just got my PayPal payment confirmation! This may not seem like much, but it certainly adds up quick as long as you take the surveys available to you. This is a great survey site that pays you cash (or Amazon gift card, your choice) for every survey you take. There are no points to save up and redeem, and they usually pay within a week of taking the survey. NOTE: This is just one survey site I personally use and get paid for. You can see the other site I use and read more info on them in this post here. Click here for more info on OpinionPlace. i just took my first survey on there about a week and a half ago and i just got my 2.00 in amazon credit also :) yay, better than nothing. but you can only do them every so often...like i can't participate in another survey on there until tomorrow night after 9pm my time.